Warning signs and tags help prevent accidents and injuries in many workplaces. They are so common that most people don't consciously even see them. Despite the fact that they don't actively look at them, however, people can immediately recognize the warnings and their intended messages. This is because OSHA has a lot of different requirements for what goes on these signs and tags. The specific layout and design of these signs and tags has been proven to quickly convey important messages, even when people hardly glance at them. All employers are required to put these types of signs and tags up whenever there is a serious hazard in the area. Learning about the OSHA requirements for these signs and tags can help ensure everything is in line with the established regulations. The requirements discussed here come from the OSHA 1910.145 set of regulations. Whenever using any type of accident prevention sign or tag, it is essential to understand all the requirements. If unapproved signs or tags are used, it not only puts those in the area at increased risk, but can also result in a citation from OSHA if it is discovered upon inspection. Design - All signs and tags must either be used in compliance with these regulations or have a sufficiently different design so as not to be confusing. Application - Signs and tags used for accident prevention must follow these regulations if the hazard that prompts the warning is within the scope of these standards. Symbols - Signs and tags used to comply with these OSHA standards must use approved symbols (when symbols are required). Text - The text on the signs must follow these standards to convey a clear message to readers. Exceptions - The specific exceptions for signs designed to prevent accidents include those used on streets, highways, and railroads. In addition, these requirements do not apply to general warning notices placed on bulletin boards or posters in the facility. In this set of regulations, OSHA uses the term "sign" only to refer to any surface that has been set aside for use to warn of safety issues and/or provide instructions for how to avoid hazards. Signs can warn employees, the public, or both. 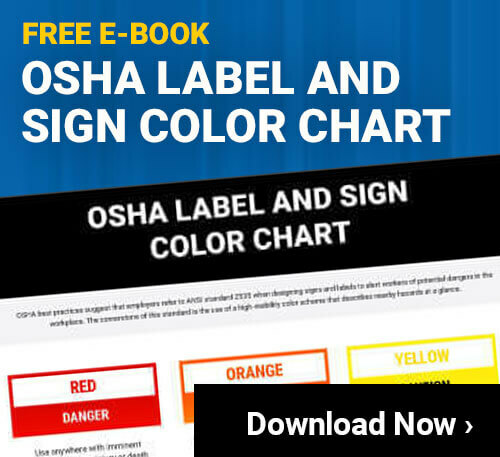 OSHA specifically states that they do not consider any news releases, safety posters, bulletins, or other similar items signs (at least when it comes to this set of standards). Safety Instruction Signs - These signs offer instructions for how someone should act or perform to avoid possible hazards. The instructions can be either positive (do this!) or negative (do not do this!). Some signs can also be used just as notices, but often aren't included as part of this overall set of standards because they have a different purpose. Notices can include things like identifying where an emergency eye wash station is located or where specific types of personal protective equipment are stored. OSHA has very specific requirements for the design of these signs. To start with, the sign itself must be safe. This means the corners must be rounded or blunted. The edges cannot be sharp and can't have any burrs, splinters, or other potentially hazardous areas. 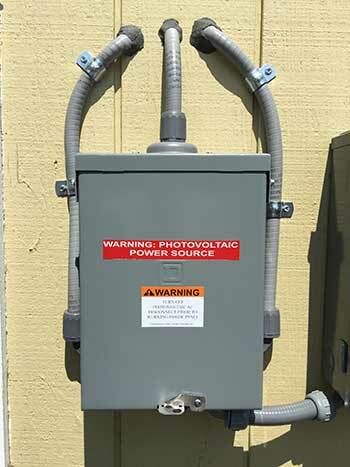 The bolts or other fasteners also need to be positioned so that they do not present any safety risk. 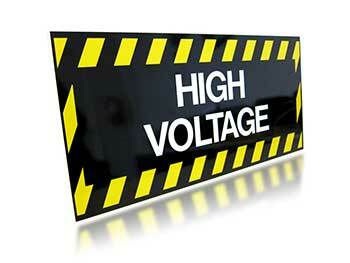 Danger Signs - These signs can use red, black, and white. Caution Signs - The background should be yellow, and any letters printed on the yellow background should be black. Safety Instruction Signs - The background of these signs should be white. The panel needs to be green with white letters. All the text printed on the white background should be black. Whenever a warning sign is used, the wording must be concise and easy to read. It also must be easy for the average person who would be reading it to understand, which means highly technical or scientific terms should be avoided. All wording should be made as a positive statement that reflects the facts of the hazards in the area. Accident prevention tags differ from signs in a variety of ways. One of the most significant is that tags can be applied to a specific item, which may be able to move around. Signs, on the other hand, are typically stationary and hanging on an immobile area (a wall, machine, etc.). Tags will also be smaller than signs, which means efforts must be made to fit in all the necessary information in a way that is still readable and conveys the desired message. The words have the same usage as with signs. There are many approved major messages. These messages (whether text, pictograms, or both) must be immediately understandable by people who can be expected to see them. Safety tags used in a work environment should be understood by all the employees. Those used in public areas should have a very common meaning that the average person will easily understand. Why Are Warning Signs & Tags So Restrictive? Training - All employees, no matter where they have worked previously, will already understand the meanings of the warning signs and tags. This helps ensure they are safe from their very first day. Conflicting Information - Having a sign or tag mean one thing in one area and another in a different area can cause confusion, which can lead to increased risk. Mobile Products - Virtually all facilities today rely on other companies to produce products or parts that they use. If these products or parts are made in one area, they may arrive with a set of safety signs. Having all facilities follow the same OSHA standards ensures all these tags are the same no matter where they come from. OSHA also knows these types of signs are only used in very specific situations. Rather than have a broad set of standards that applies to all signs in all facilities, OSHA wisely provides very narrow requirements that apply only to areas where there are real hazards. This allows employers to easily comply with the necessary requirements, while still having the flexibility to use their own internal visual communication options when necessary. While it is certainly going to take effort to comply with these OSHA standards, in the long run it can save a lot of time and money, while also improving the safety of the workplace. Companies quickly find that remaining in compliance with these OSHA standards is worth the effort whether there were penalties involved for failure to comply or not.